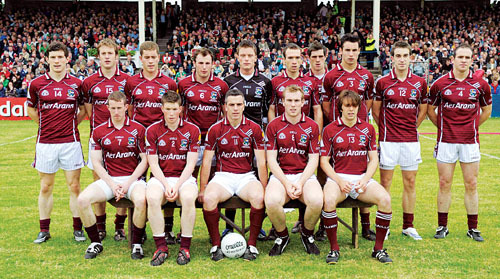 The victorious Galway team that recaptured the Connacht title at McHale Park, Castlebar last Sunday. Triumphing in McHale Park is always tasty, and this Connacht final win was particularly nutritious. A year ago the acute disappointment of losing to Sligo brought rare distress to the Galway footballing hinterland, but hope has gradually returned to the system. Now a stimulating trip to the hallowed turf of Croke Park beckons for Liam Sammon’s evolving team. This satisfactory success tickled the partisans that travelled to Castlebar, and Sammon’s thoughtful approach has drawn admirers. Mayo strained every sinew to test Galway’s resolve in a vigourous second half, and the victors answered all the pertinent questions that were posed about their fibre. It was a contest dotted with smashing Galway contributors. Finian Hanley was immense at full back, Gareth Bradshaw’s enthusiasm even saw him steal forward to kick a point. At centrefield Barry Cullinane nullified Ronan McGarrity, while all the attack donated handsomely, with Padraic Joyce offering guile and efficiency on the 40. Joyce’s 1-3 was brimful of relevance to the narrative and ultimately the Killererin talisman’s influence brought Galway’s burgeoning provincial tally to 44 titles. The selection commitee of Sammon, Jimmy O’Dea, Tom Ryder, and Richie Fahey could leave the bowl fulfilled too as the raft of substitutes introduced all made positive statements with Sean Armstrong and Paul Conroy especially effective. The first half was all about perspiration until Galway assumed control. Galway were fashioning goal-scoring opportunities with encouraging frequency and by the time Padraic Joyce nailed the first major 20 minutes in, Nicky Joyce and Cormac Bane had already come close to rattling the Mayo net. The Mayo full back were being tormented and struggled to deal with a Galway team that was mixing the short and long games imaginatively. Galway trailed by 0-3 to 0-2 when a burst of maroon superiority saw them reel off 2-2 without reply to seize the initiative. Inevitably Padraic Joyce occupied a seminal role in Galway’s pocket of dominance, drilling over a tidy point before providing a precise finish past David Clarke. Then Bane rifled over another nifty point on the turn as Galway’s high productivity continued. John O’Mahony was agitated on the line, and the worry increased as Galway bagged a second goal. There was a touch of craft to the build up as Matthew Clancy and Michael Meehan did the spadework for Fiachra Breathnach, who slid the ball over the line. Galway were rocking, but remedial work was carried out on the Mayo rearguard with Peadar Gardiner and Aidan Higgins stabilising the previously shaky defence. Mayo concluded the half with a flourish, stitching three points together in a quick sequence. Alan Dillon struck either side of a McGarrity effort as the deficit was chiselled to four. The early stages of the second half were worrying for Galway as a restructured and rejuvenated Mayo were vexing the visitors. Galway still held a two point advantage by the 51st minute, but then Mayo struck for a tonic goal. Alan Dillon, whose clever running was a salient feature of the contest, lofted a free deep into Galway territory and Tom Parsons batted the ball across goal. Substitute Aidan Kilcoyne reacted rapidly and Mayo were suddenly ahead. Would all Galway’s early enterprise be rendered meaningless? The previously subdued Castlebar audience were now responding and Mayo’s belief was soaring. Having suffered so many anxious moments in the opening period Mayo were now content. Galway were forced to deal with an awkward scenario, but admirably demonstrated courage and conviction. The contest was now dripping with intrigue and appropriately the dying embers were fraught with tension. A Dillon free edged Mayo in front with five on the clock, but then Galway hit three beauties on the spin. Liam Sammon’s replacements buzzed around with waspish intent as Armstrong and Conroy both landed crucial scores. Bane put a bit of flesh on the Galway lead before the last gasp Mayo flurry saw them strive boldly for a goal. Despite putting Galway under duress all they could muster was another Dillon free and Galway were crowned kings of Connacht again. Galway: P Doherty; G Bradshaw (0-1 ), F Hanley, D Burke; N Coyne, D Blake, G Sice; B Cullinane, N Coleman; M Clancy, P Joyce (1-3 ), F Breathnach (1-0 ); C Bane (0-3 ), M Meehan (0-3, 2fs ), N Joyce. Subs: K Fitzgerald for Coyne (35 mins ), S Armstrong (0-1 ) for Clancy (36 mins ), P Conroy (0-1 ) for Coleman (52 mins ), M Lydon for N Joyce (55 mins ), N Coleman for Breathnach (70 mins ). Mayo: D Clarke; K Conroy, K Higgins, C Boyle; T Cunniffe, D Heaney, J Nallen; R McGarrity (0-1 ), T Parsons; A Dillon (0-7, 5fs ), P Harte (0-1 ), T Mortimer (0-1 ); C Mortimer (0-2 ), A O’Malley, A Moran. Subs: A Kilcoyne (1-0 ) for T Mortimer (21 mins ), A Higgins for Boyle (30 mins ), P Gardiner for Conroy (30 mins ), BJ Padden (0-2 ) for O’Malley (39 mins ), M Ronaldson for Parsons (67 mins ). Referee: D Coldrick (Meath ).